People often use the term “night to remember” to recall a timeless evening full of unforgettable fun. There’s often music, dancing, and romance involved. But guess what? We’re redefining that old saying. Now, by royal decree, YOU are the “knight to remember.” Indelible. Heroic. An everlasting image of bravery and valor in the minds of all you meet. 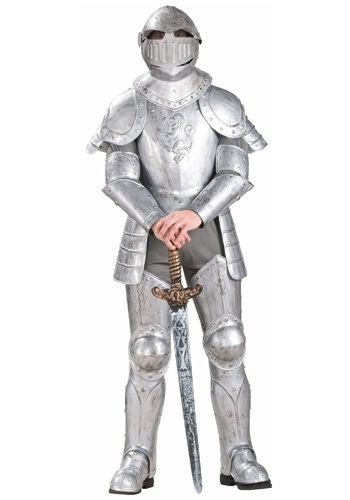 This Medieval Knight Costume ensures that your every move is more than memorable. Whether you don this look to rescue a Halloween party from the evil of trite and boring costumes or you wear this warrior garb to greet your friends at the Renaissance Fair, this suit of armor ensures that you can defeat the other competitors in any costume competition and win the hand of whomever you’re trying to impress! Want to REALLY ensure you’re a knight to remember? Sit back and let the princess rescue you from a duel! No one will see it coming and it will stick with the audience for years to come. This costume boasts a complete coat of (plastic) armor that’s brimming with details like embossed rivets and joints, plus a lion embossed on the chest plate. Adding a swift sword and solid shield will help make you even more memorable, but seeing as this outfit’s helmet covers your whole face, you may want to pick up one of those “Hello, My Name Is_______” tags if you’re worried your name won’t live on as infamously as this knight costume!